Stoke City boss Mark Hughes says his under-fire side will 'win more games than we lose' if they can repeat the quality of performance they showed in their 1-0 defeat at Burnley. It was the Potters' fourth loss in five games, and left them just three points clear of the relegation places - and still a target for angry fans. But Hughes told BBC Radio Stoke: "I'm more than happy with that. "l've got no complaints. We restricted them to very few opportunities." He continued: "I'm encouraged by it. If we keep producing performances like that, we'll win more than we lose. We've done all right up to a point. "Coming to Burnley is one of the harder games in this league now and we've shown a real desire to get something out of it. We made sure we were stronger in key areas. "There's a lot of frustration at the moment. We just have to keep a thick skin, let it wash over us and get on with it." After conceding five goals to Tottenham Hotspur at Wembley on Saturday, Hughes made one key tactical change at Turf Moor, reverting from a three-man back line to a 4-4-2 system. 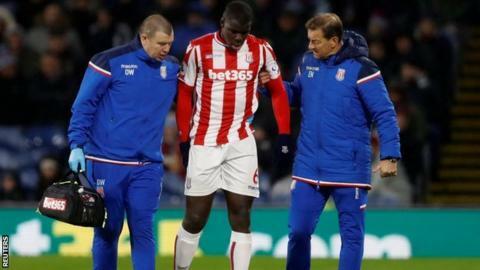 But the efficiency of that plan was disrupted when on-loan Chelsea defender Kurt Zouma limped off after 66 minutes - and the Potters may have to now manage without him this side of Christmas. "Losing Kurt Zouma affected us," said Hughes. "We think it's his hamstring. "We're hoping it might just be a bit of cramp, but the likelihood is that he might miss a couple of games." Zouma was replaced at Turf Moor by £18m summer signing Kevin Wimmer, and Hughes now has a decision to make over who will fill the role when fellow strugglers West Ham United visit Stoke on Saturday. His main concern, though, is that his whole team produce the same "committed performance" against a Hammers side likely to contain Potters old boy Marko Arnautovic. "We had a terrible 45 minutes in the second half at Wembley," added Hughes. "But we had a different mindset tonight and we've just come up short. "We showed determination and drive and we need more of the same at the weekend."